Combine first 5 ingredients in a large bowl; let stand 10 minutes. Spoon fruit mixture into a 13 x 9-inch glass or ceramic baking dish coated with cooking spray. Bake at 400° for 35 minutes or until bubbly. Combine oats and next 3 ingredients (through salt) in a bowl. Drizzle with butter, stirring until crumbly. Sprinkle oat mixture over fruit. 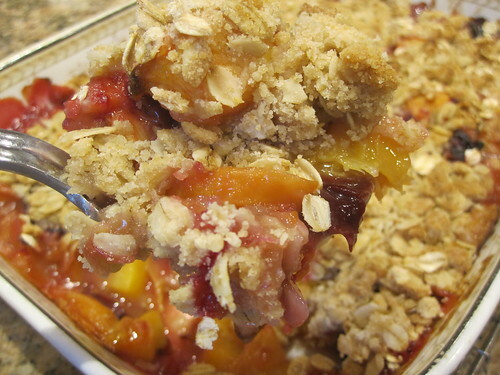 Bake an additional 15 minutes or until topping is lightly browned and fruit is bubbly. Serve warm with ice cream.